French pharmaceutical giant Sanofi-Aventis (SNY) sent a letter to major U.S. biotech firm Genzyme (GENZ) proposing a friendly takeover valued at $69 a share, or $18.4 billion, several media outlets reported Tuesday, including Reuters and The Wall Street Journal. Bloomberg says the offer outlined in the letter was $67 to $70 a share. But for now, it seems the gap between the two companies is too wide to be easily bridged: Sources say Genzyme is looking for an offer of at least $80 a share, or $21.3 billion. Meanwhile, Sanofi shareholders are concerned about paying too much for Genzyme, and some told Reuters they would not be happy paying much over $70 a share, or around $18.7 billion. Some analysts believe Genzyme would accept an offer around $75 a share, rather than risk seeing its stock price drop back to where it was before reports of Sanofi's intentions surfaced -- just over $50. 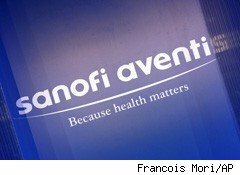 To ink a deal, Sanofi-Aventis will have to contend with three major shareholders: Chairman and CEO Henry Termeer, who previously said the company was not for sale; activist investor Ralph Whitworth of Relational Investors, who sits on the board; and fellow activist investor Carl Icahn. Massachusetts-based Genzyme is coming off a turbulent year which saw sales and profit slump. But the rare-disease drugmaker still holds considerable appeal for a company like Sanofi-Aventis, which is facing a major patent cliff: Five of its eight best-selling drugs will lose patent protection and face generic competition by 2012. Genzyme could help it offset lost sales and boost its weak biotech division. Genzyme shares climbed 1.5% in premarket trading to $71.40.